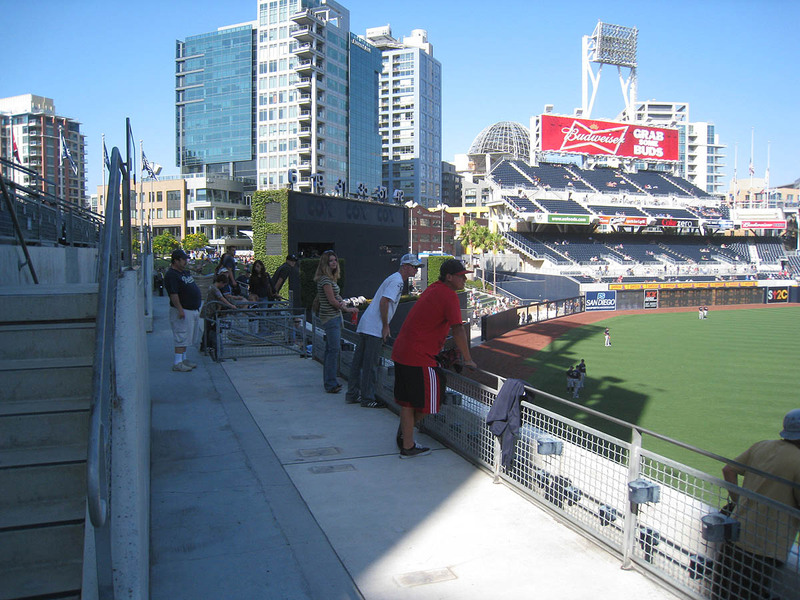 This was the final game of my west coast trip, and I was gonna have to leave early. Game time was 5:35pm, and my flight back to New York was scheduled for 9pm, so I figured I’d get to see the first five innings or so. 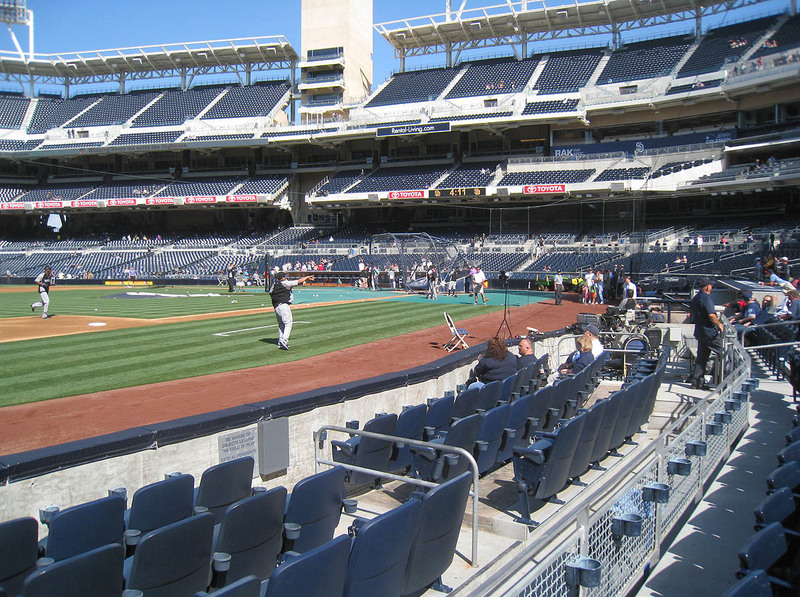 When I first entered the stadium, I was disappointed to see that batting practice wasn’t yet underway, but I still managed to snag a ball quickly. 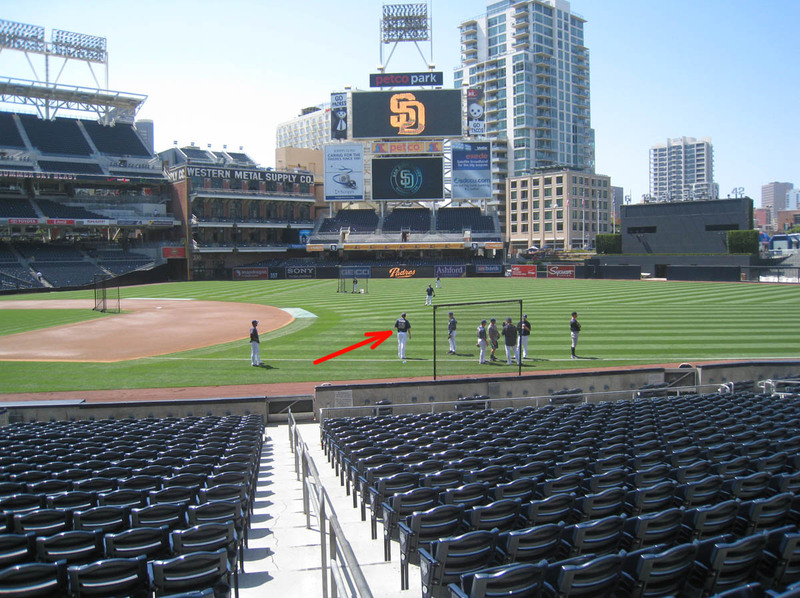 Brad Brach (indicated below with the red arrow) was playing catch along the right field foul line . . .
. . . and when he finished, I got him to hook me up. One minute later, a Rockies coach approached the dugout with a ball in his back pocket. I was already standing in the front row when he arrived, and I got him to toss it to me. Unfortunately I don’t know who either of those guys were. 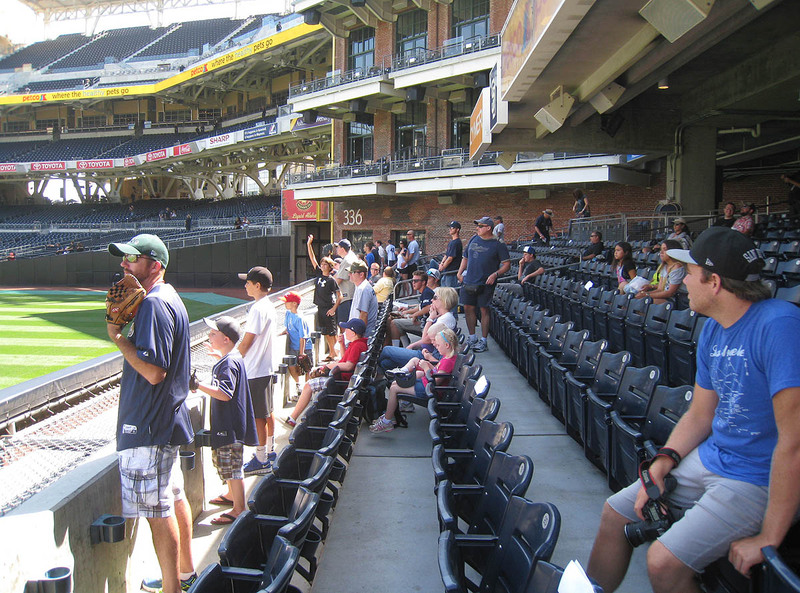 Cameron Maybin threw me my 5th ball of the day, which I promptly handed to the nearest/smallest kid. 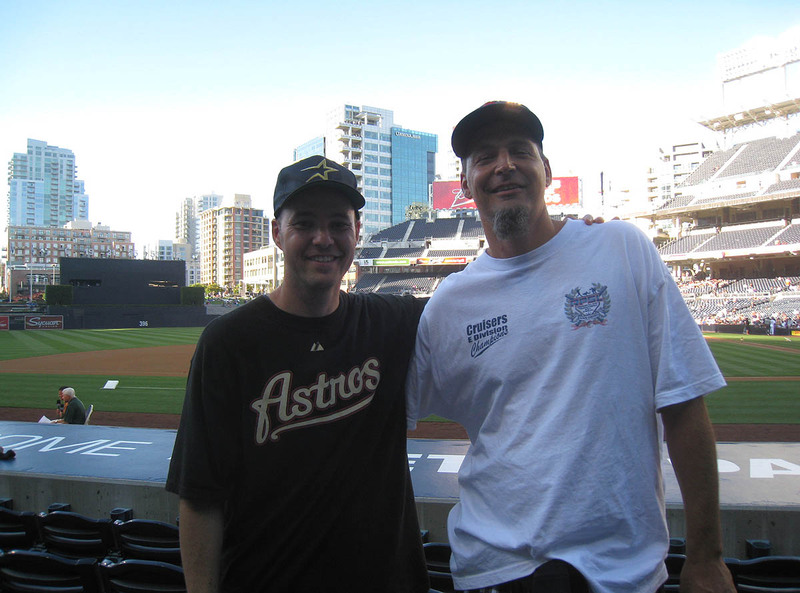 1) The ONE home run that reached the seats in straight-away right field went right to my friend T.C. 3) T.C. shouted, “I got it! I got it! I got it!” as the ball descended toward us. 4) I backed off and leaned out of the way and let him have it. 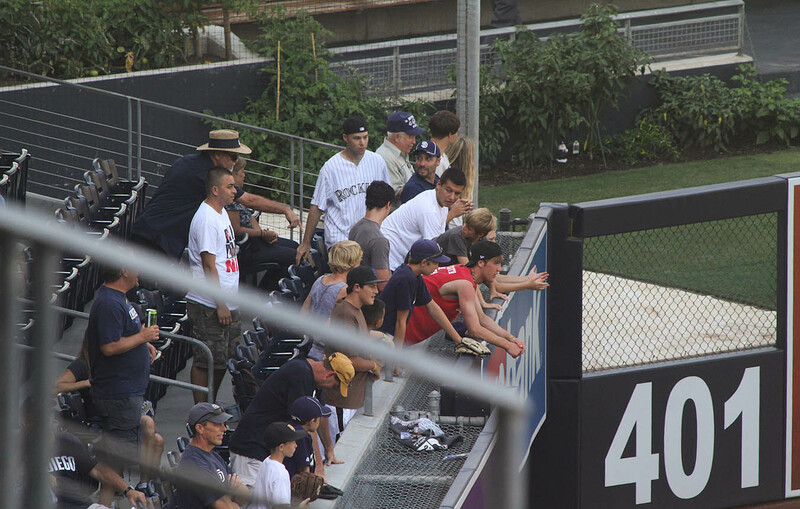 In New York City, fans catch whatever they can catch. The very best of friends will cut each other off and climb up on seats and jump and reach and talk a whole lot of trash along the way. 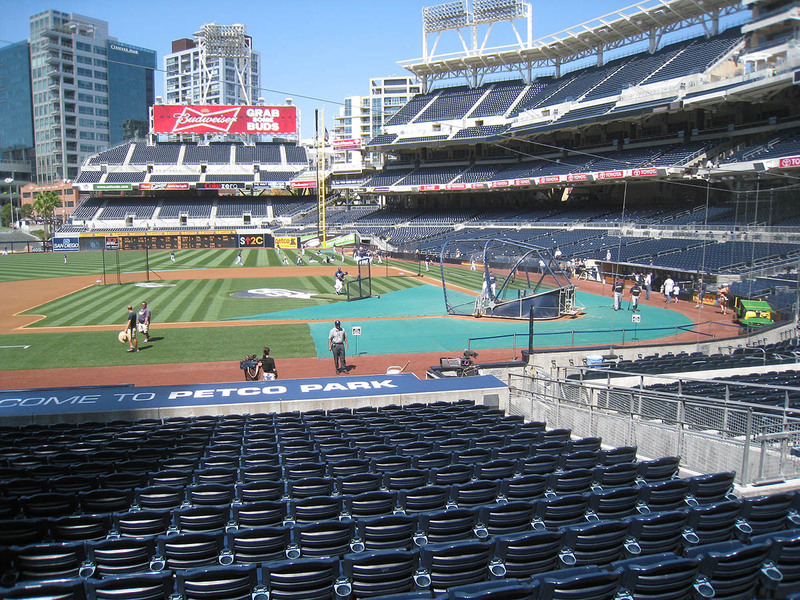 Basically, it’s an all-out competition, but in lots of other places, fans often back off if they realize that a ball is heading toward someone else. I certainly didn’t need to let T.C. catch that home run, but it seemed like the right thing to do. 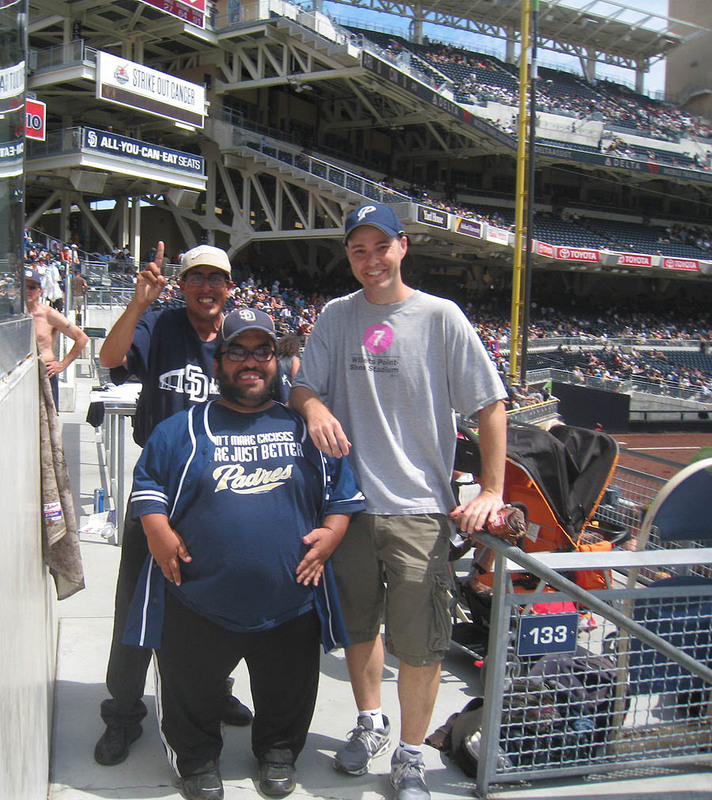 He attends every Padres game, so the way I saw it, I was in his house and wanted to be respectful. In addition to that, he *only* tries to catch home runs, and I knew that I’d have more opportunities to get toss-ups, so yeah, I gave way to the elder statesman. And it was frustrating. I was in a real home run slump. For some reason, I hadn’t caught any homers during my entire trip to California — and yet I was still averaging more than 10 balls per game. In case you can’t spot me in the photo above, I’m on the far left side. 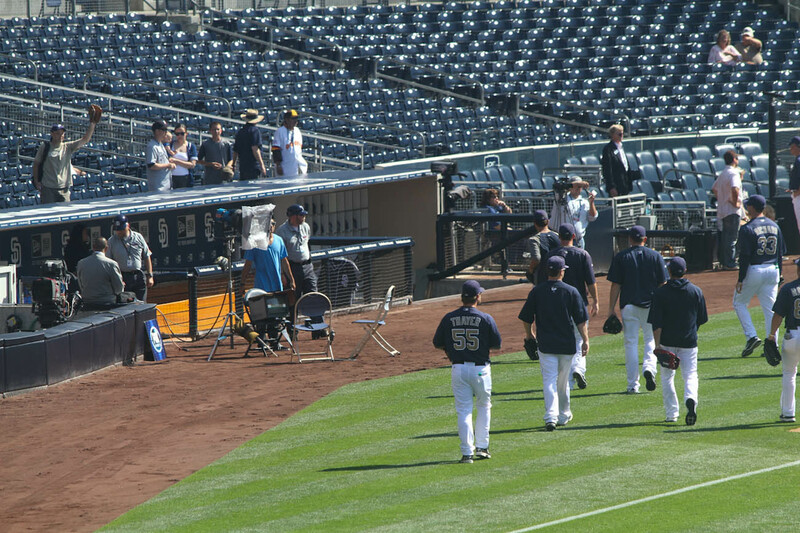 Edinson Volquez threw me my 6th ball of the day, and then I got the other Padres player’s kid to toss me another. Now, do you remember the tweet I posted about forgetting my Rockies cap in New York? Well, it didn’t end up making a difference. As I mentioned before, I had a Rockies jersey, and as for my headgear . . . I wore my umpire cap backwards. I was already up to 10 balls for the day, and less than a minute later, I lunged over the wall and grabbed an overthrow that trickled by. 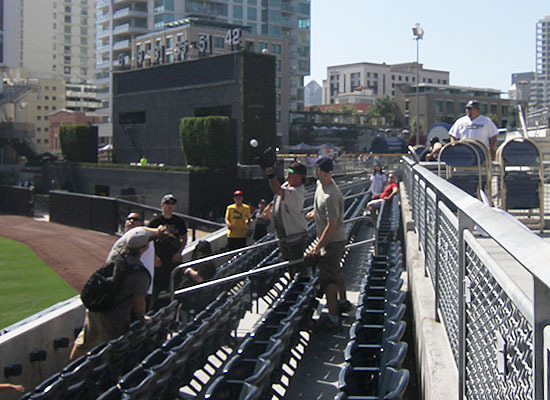 Then, two minutes after that, I snagged a popped-up slicer near the corner spot that tipped off another fan’s glove. I don’t know who was hitting, but I can tell you that there were a couple of righties launching bombs. After several close calls, I finally got my chance. I ran to my left through this cross-aisle . . .
. . . and made a leaping/lunging catch. That one felt good. I hadn’t lost my touch after all. Unfortunately, though, that was it for BP. 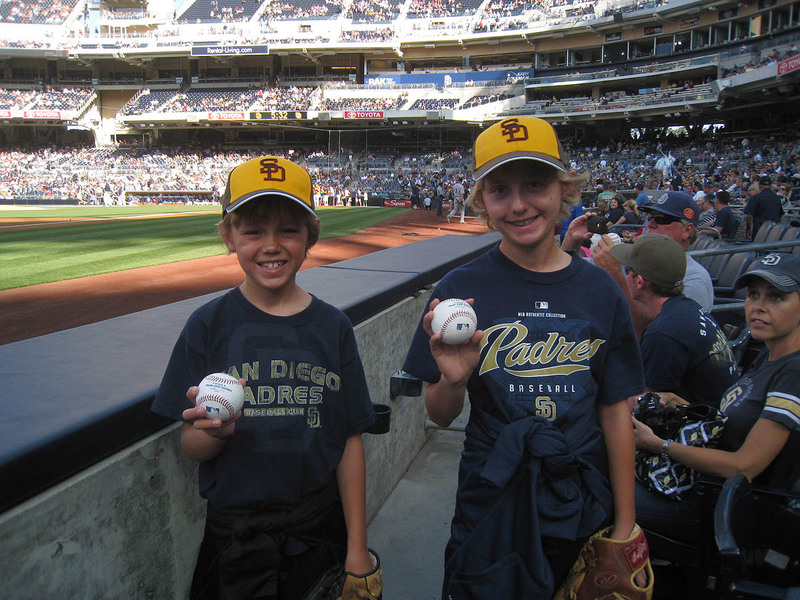 Their names are Ryan and Cory — future major leaguers, who will hopefully return the favor someday. I chatted briefly with their father Jack and was glad to help send them home with a couple of souvenirs. 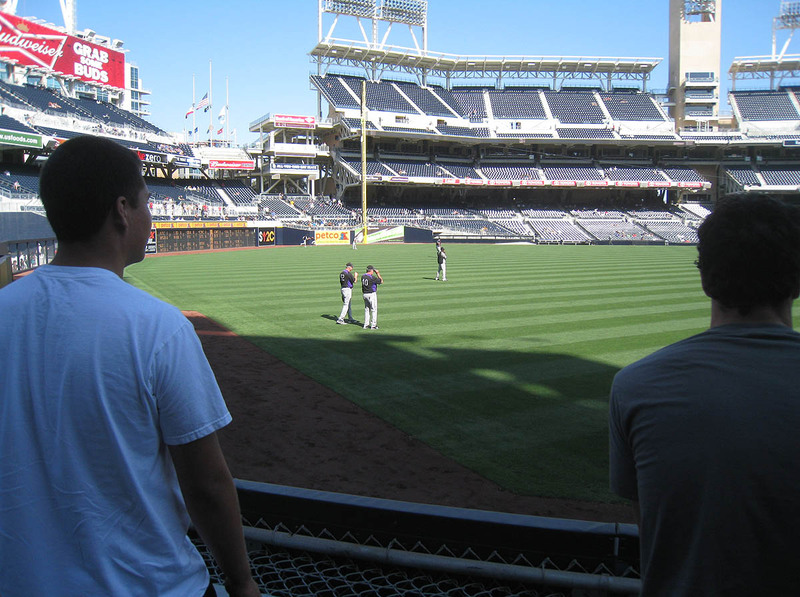 Then I moved to right field . . .
. . . and chatted with Franklin and Ismael and Luigi for a couple innings. 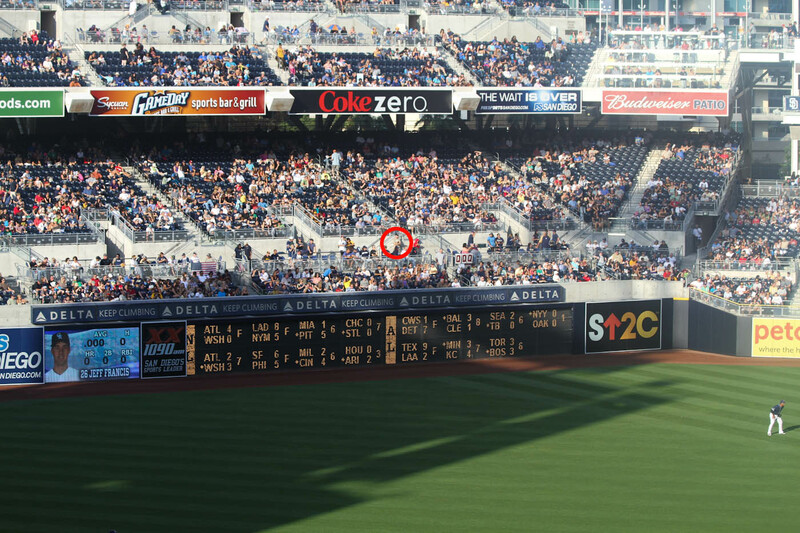 Of course I was mainly there to catch a home run, but nothing came anywhere near me. 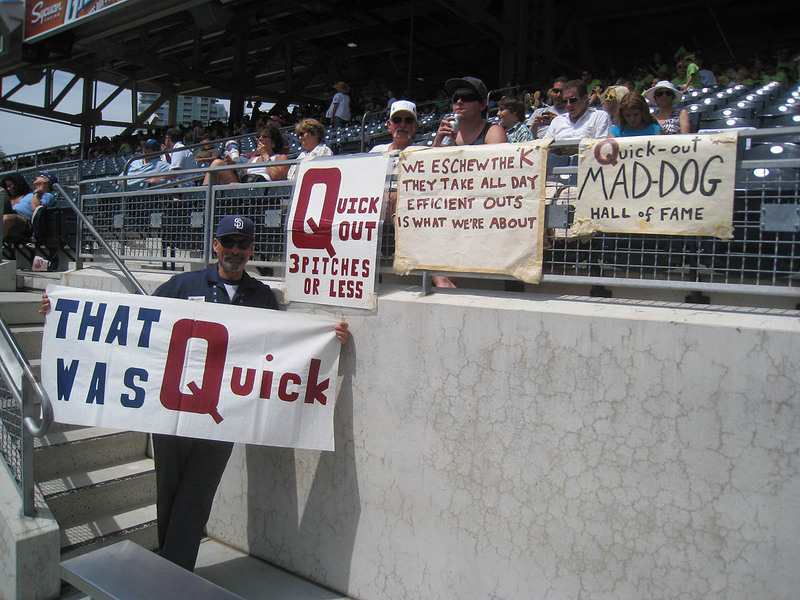 The Rockies had a 6-5 lead when we started driving to the airport, and when I arrived home in New York eight hours later, I found out that they’d won, 8-6, in 12 innings. It would’ve been nice to catch a game home run on this trip, but overall I have no complaints. I hung out with friends and family . . . and snagged 68 balls in 6 games. Not bad. • 331 balls in 41 games this season = 8.07 balls per game. 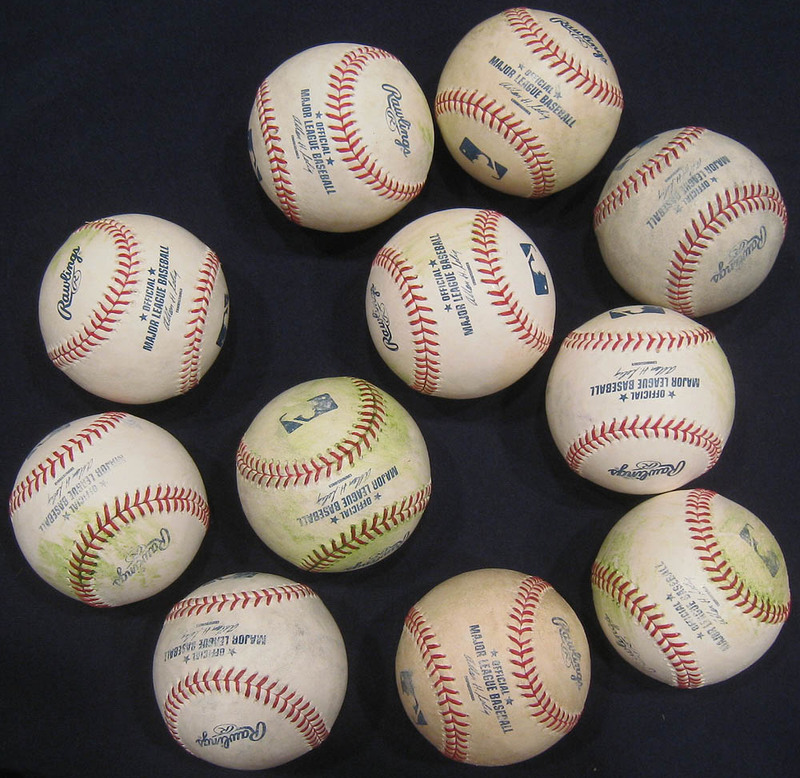 Seems you get a lot of balls from umpires… What’s your secret in doing that? Parked at the same lot with the big baseballs last summer. 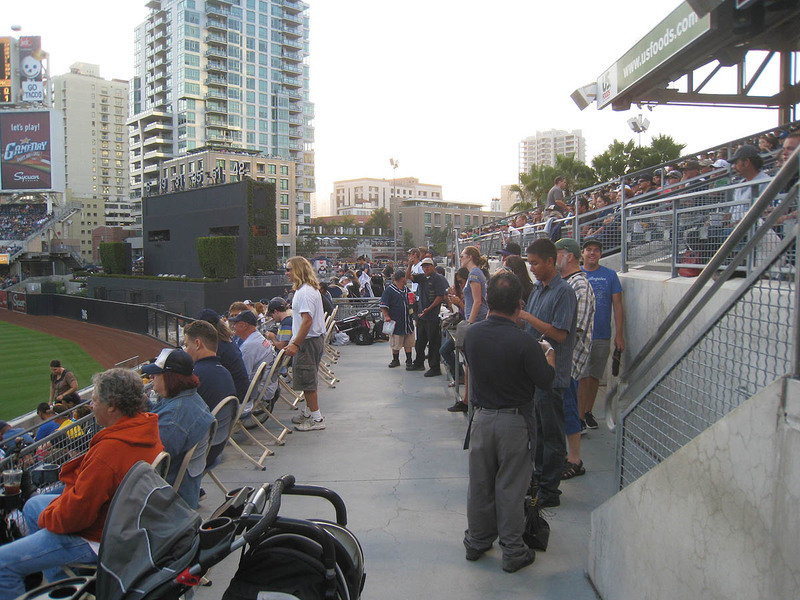 Petco is a nice park! 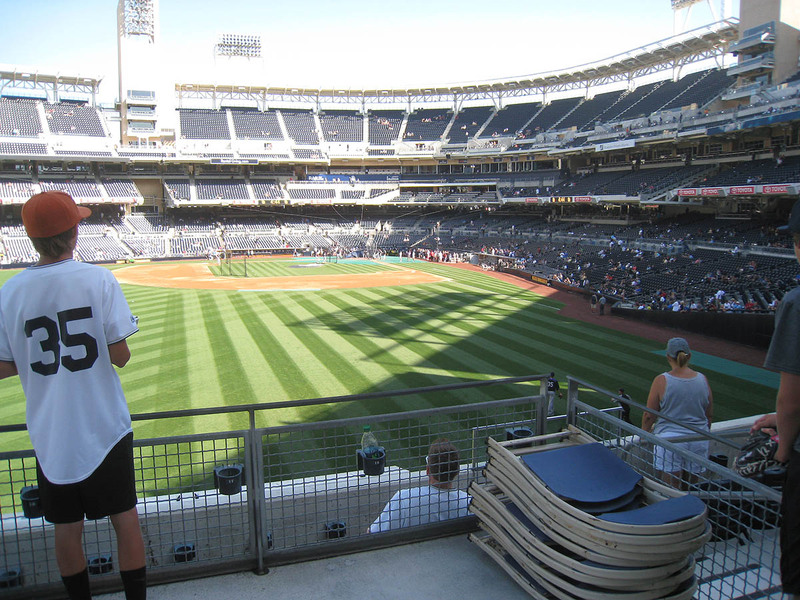 I caught a BP HR in the sandbox last year off Brad Hawpe. There were only three people and it was earlier in the season with no sand sculptures. Just wondering Zack. If you had no balls when it was time to leave, would you have ditched the flight and try to preserve your streak or ditch your streak and catch the flight? not bad? That’s 17 more than my entire collection! That’s a hell of a week! I’ll snag 14 someday. Wow, I completely misinterpreted your email. I thought you got only ONE ball at this game not one home run on the fly. I blame the fact that it was early Friday morning and I was at work. 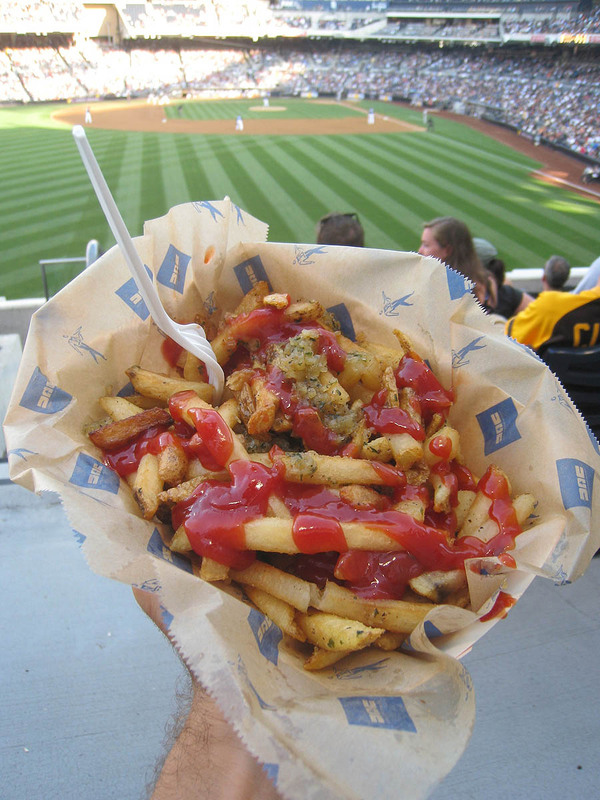 Yea, that’s my excuse…..
I’ve never tried it before so maybe its wonderful, but that ketchup all over those otherwise beautiful garlic fries just looks WRONG!!! After the game, just hang out where they walk off the field and ask ’em. Definitely visit the Clevelander. It’d be annoying every day, but it’s great once or twice. 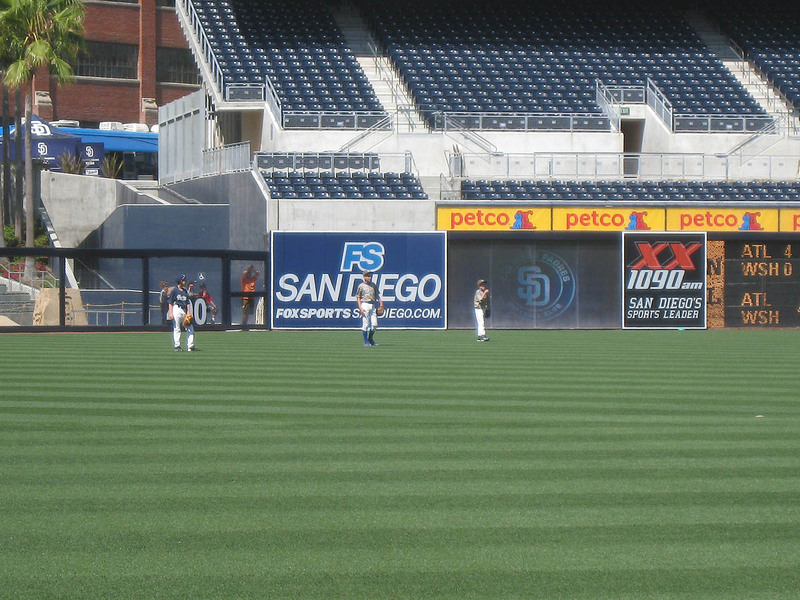 I don’t think I’ve ever seen PETCO without those sculptures. Good question. I actually thought about that, and I decided that I would definitely have to miss my flight. The bad thing is that Bob Davidson was the home plate ump at this game, and he’s one of the least friendly people I’ve ever encountered in the baseball world, so I would’ve had to find another way to keep the streak alive. Yes you will . . . especially if you get the hell out of New York. 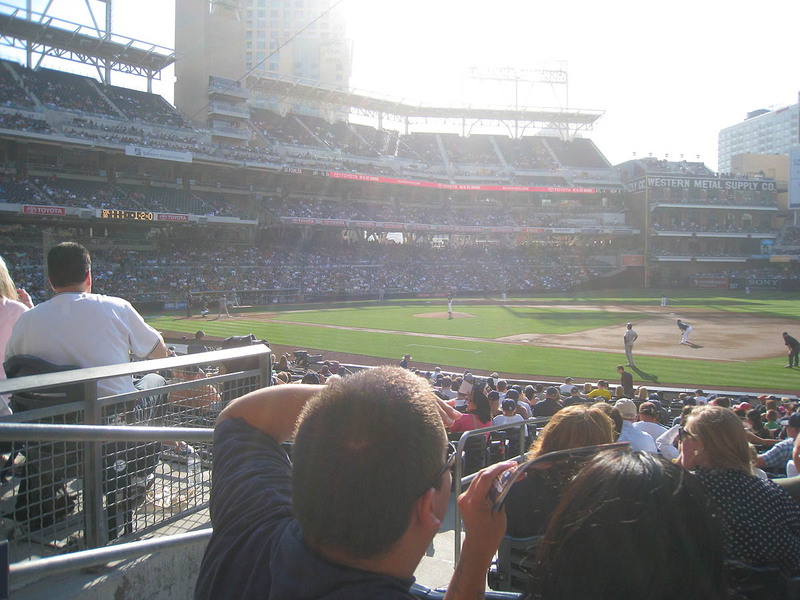 I’m offended to hear that you thought I only snagged ONE ball at a game at PETCO with batting practice. Hmph! Try it. Then get back to me. 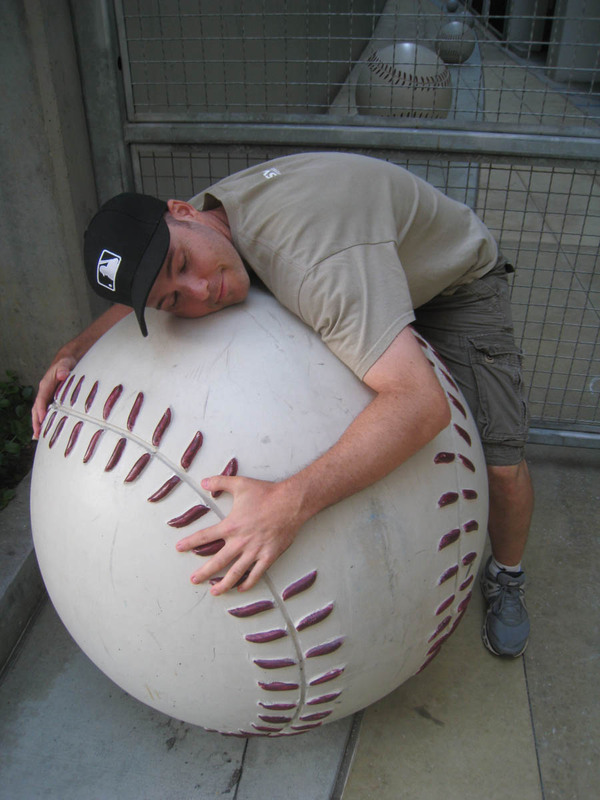 The picture of you and the giant baseball is perfect. It would make a great Xmas card or book jacket photo.